December 27, 2017 /27 Comments/in Featured Articles, Jewish Ethnic Networking, Jewish Writing on Anti-Semitism /by Andrew Joyce, Ph.D.
Manuel Rodrigues, Jesuit curia in Rome. The complaints of native Spanish members of the Society of Jesus, regarding the crypto-Jewish Jesuit elite, are remarkably uniform. Predominant among their concerns was the Jewish tendency towards monopoly, nepotism, arrogance, aggressive ambition, and an air of insincerity in the practice of Christianity. Of particular concern was the fact that the Spanish Jesuit Order was becoming an exclusive enclave of influential Jews that stretched out even into the heart of Rome. In order to combat crypto-Jewish nepotism and extensive ethnic networking, native European Jesuits developed very interesting counter-strategies that in many respects mirrored their Jewish counterparts. Again, the patterns seen here should be regarded as broadly supportive of Kevin MacDonald’s analysis of the reactive nature of anti-Semitism in Separation and Its Discontents, where one of the key chapters concerns National Socialism as a mirror image strategy. What non-Jewish Jesuits essentially did in the early stages of the revolt from below, was, like their crypto-Jewish opponents, to establish their own secretive networks based on racial exclusion, and the selection of their own preferred candidates based on ethnic preference. Pope Gregory XIII soon disclosed his support for a non-Spanish alternative to Polanco, who, in turn, indicated that he would step aside but refused to prohibit other “Spanish” candidates from being elected superior general. After the congregation opened, Gregory XIII inquired about the procedures of the congregation, about the number of Spaniards among the voters, and about the national background of the previous superiors general. 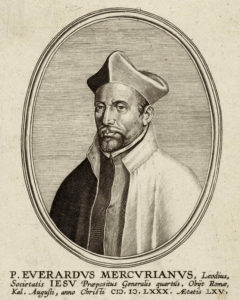 Gregory “remarked that somebody should be chosen from a nation other than Spain, and, in spite of Polanco’s protest against limiting freedom of conscience of the electors, the pope specifically suggested the name of the Walloon Everard Mercurian, then dismissed the delegation with his blessing (122).” Consequently, while the converso Antonio Possevino was “addressing the congregation with an opening discourse, Cardinal Gallio of Como arrived and informed the congregation that he was representing the pope’s will to prevent the election of any Spanish candidate.” (122) The next day the assembly chose Everard Mercurian as the next superior general on the first ballot by a majority of 27 votes. However, in the aftermath of the removal of crypto-Jews from influence throughout the upper echelons of the Society of Jesus, a new movement emerged within the Spanish Jesuits called the memorialistas or memorialists. The group got its name from ‘memorial,’ which was a literary genre consisting of a written statement of facts presented in conjunction with a petition to a royal or religions authority. The memorialistas gained their name by sending “secret memorials to the Spanish Court and Inquisition, and the Holy See, asking for the reform of the Jesuit Institute, and, especially, for the autonomy of the Spanish Jesuit provinces.” (125–6) These memorials were highly divisive and destructive, seeking essentially to fracture the Society and to allow the conversos to recoup their power base in Spain. In regards to the offices of government, we should be careful not to give them to these people [conversos] in certain key places.… In what regards the admission of this people in order not to give occasion of bitterness to many in the Society, we have judged to be inappropriate to prohibit universally the admission of those who somehow have this defect. It is necessary to use more selectivity and diligence in the admission.… At any rate, [genealogical investigations] should be done quietly and when somebody has to be excluded, it would be convenient to give some other apparent causes and reasons for his dismissal, so that it could not be understood or affirmed with certainty that a person is barred from admission because of his lineage (147). Maryks states that at this point “the lineage-hunting season began,” and the removal of all persons of Jewish ancestry from the Society of Jesus commenced in earnest. There are countless more examples from countless other countries. The tactic therefore relies on convincing the population that Jews are not the foreign threat but rather that it is the growing volkisch movement that is the foreign entity threatening the nation. Although it’s an absurdly perverse claim, and hard to imagine as being successful, Jews are able to spread the message because of their superior media and political power (as seen with Tetrick’s efforts). This power has ensured that portrayals of nationalist movements as ‘foreign’ have been tactically effective in the past. The Jesuit Order as a Synagogue of Jews is an important contribution to the study of religion and ethnic conflict in early modern Spain. Although not suited for beginners to any of the themes under discussion, the book is concise, and its four chapters are filled with new information sure to fascinate the reader with some prior knowledge of the Jesuits, Spanish history, or the Jewish Question in Europe. My only real criticisms rest on matters of style and structure. Maryks’ writing style is often mechanical, and one sometimes feels that, while the material lends itself to a dramatic narrative, that potential is lost amid bland observations and repetitive recourse to lamenting the “bias” and “discrimination” of the “Old Christians.” Certainly this is a book in which the facts, rather than the author’s analysis, lead the way. As regards structure, the text has an irritating habit of repetition, particularly in terms of persistently re-introducing characters we would already be familiar with. I found this especially disappointing because of a normally high quality of editing from Brill. These minor irritations aside, The Jesuit Order as a Synagogue of Jews was a page-turner. Perhaps best of all, it’s now been made available to download for free as part of Brill’s open source initiative. Enjoy. K. MacDonald, Separation and Its Discontents: Toward and Evolutionary Theory of Anti-Semitism (1st Books, 2004), 232. A. Lindemann & R. Levy (eds. ), Antisemitism: A History (Oxford University Press, 2010), 136. T. Wagner,’Belated Heroism: The Danish Lutheran Church and the Jews, 1918-1945,’ in K. Spicer (ed), Antisemitism, Christian Ambivalence, and the Holocaust (Indiana University Press, 2007), 7.